I promise you that you can put this together in under 5 minutes. You can probably make it in less time than it took me to write the directions for this post. 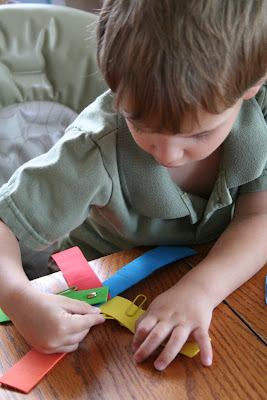 I found a pack of 5" x 8" foam sheets and colored paper clips at the Dollar Tree ~ so under $2 for the little color matching tool and you will have sheets of foam left over as well as a plethora of paper clips. 2. Stack the foam strips on each other and pierce through the stack on one end with a brad. 3. 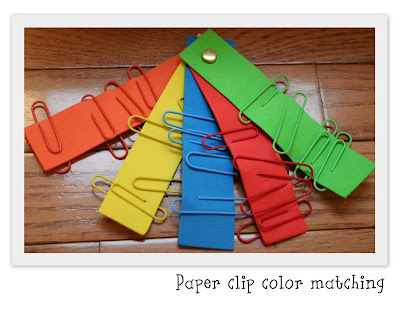 Match 3 to 4 paper clips with each strip. See? It really is that easy! Be sure to check out Carissa's Tools for Tots page for some more great homemade ideas as well as the Totally Tots Simply Made posts. Love it - that is a great idea for my three and four year old. I'm so blessed to have found you through Carisa! I'm going to make this! Thanks! I did this a few years ago and laminated the squares. I will have to brad fasten them, that is a good addition! Totally love the idea of clipping them together with a brad! You are so inventive and creative! Love the idea of clipping the strips together. I love this idea! Your blog is AMAZING! I wish I had a whole day to look at it. Your great, thank you so much for sharing your ideas. Wonderful idea...especially the brad to! I'll definitely have to share! Thanks! Thanks for sharing! I'll link to you from Dollar Store Crafts tomorrow!